All of MacServe's servers are located at the best possible environment for any size company in the world. That is why MacServe has chosen the Equinix IBX Data Center facility located at the Infomart in Dallas, Texas to provide the most reliable solution for you. The Equinix world-class facilities are home to the world's largest content and enterprise companies such as AOL, Yahoo, Google, IBM, Sony, Electronic Arts, General Electric, Hotwire, Paypal, Primedia/About.com, and many others (click here to see the list). Center is manned by on-site security on a 24x365 basis. 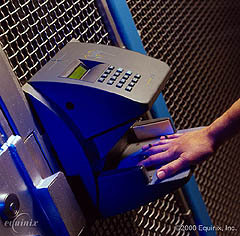 All doors, including cages, are secured with biometric hand geometry readers. All exterior walls are bullet resistant. Entire perimeter bounded by concrete bollards/planters. A silent alarm and automatic notification of appropriate law enforcement officials protect all exterior entrances. All areas of the center are monitored and recorded using CCTV, and all access points are controlled. Visitors are screened upon entry to verify their identity, and in shared situations, are escorted to their appropriate locations. Access history is recorded for audit by customers, as needed. MacServe.net is located inside the recognized Infomart telecom hotel, a private, Tier III, N+1 facility near downtown Dallas. Infomart is also home to data centers belonging to MCI, Level 3, Equinix, Verio, Switch & Data, Verizon, Telefonica and Via West. 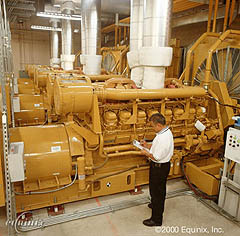 It sits on three redundant TXU electrical grids, delivering diverse power to each quadrant of the building, with five on-site 100-ton water chillers meeting N+1 cooling requirements. 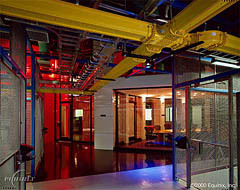 All photographs of Equinix IBX Centers are �2008, Equinix, Inc. All rights reserved.